Honeysuckle Creek tracked the two Helios spacecraft throughout its Deep Space life, in fact our very last track was on Helios 1, which was launched on 10 December 1974, round about the time we joined the Deep Space Network. We spent countless hours tracking the two Helios spacecraft. We had to modify the antenna to accommodate the Helios signals. Neil Sandford developed a grid to cover the feedcone window, opened and closed remotely from the servo console. If the servo operator forgot to open the grid for the other spacecraft, or forgot to close it for Helios, the signal was degraded by about 3db. Helios 1 and Helios 2 were a pair of deep space probes developed by the Federal Republic of Germany (FRG) in a cooperative program with NASA. Ten experiments were provided by scientists from both FRG and the USA. NASA supplied the Titan/Centaur launch vehicle. Each spacecraft was equipped with two booms and a 32-metre electric dipole. The purpose of the mission was to make pioneering measurements of the interplanetary medium from the vicinity of the earth's orbit to 0.3 AU. The spin axis was normal to the ecliptic, and the nominal spin rate of the spacecraft was 1 revolution per second. HELIOS 1 was launched on 10 December 1974, and HELIOS 2 on 15 January 1976. Both were placed in elliptical orbits about the Sun with their perihelions well within the orbit of Mercury, aphelions at the orbit of Earth, with orbital periods of about 190 days. 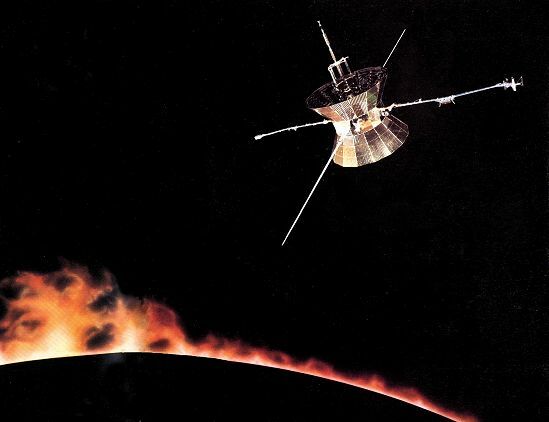 What made the two Helios missions so unusual was that the two spacecraft made incredibly close passes to the Sun resulting in very high orbital speeds. These high speeds resulted from the fact that both probes were placed into very elliptical orbits around the Sun. When a probe is placed into a circular orbit, its speed remains a constant. When in a highly elliptical orbit, however, a vehicle will reach very high speeds when it is close to the body it is orbiting but slow down considerably when it is far away. The Helios missions both orbited in this manner, with a furthest distance (or aphelion) of nearly 1 Astronomical Unit (AU), which is the distance at which the Earth orbits the Sun. Meanwhile, the closest approach (or perihelion) of the Helios probes was about 0.3 AU, closer than any spacecraft had been at the time. The eccentricity of such an orbit is about 0.54 with a period of about 190 days. HELIOS 2 IS THE FASTEST MAN-MADE OBJECT. 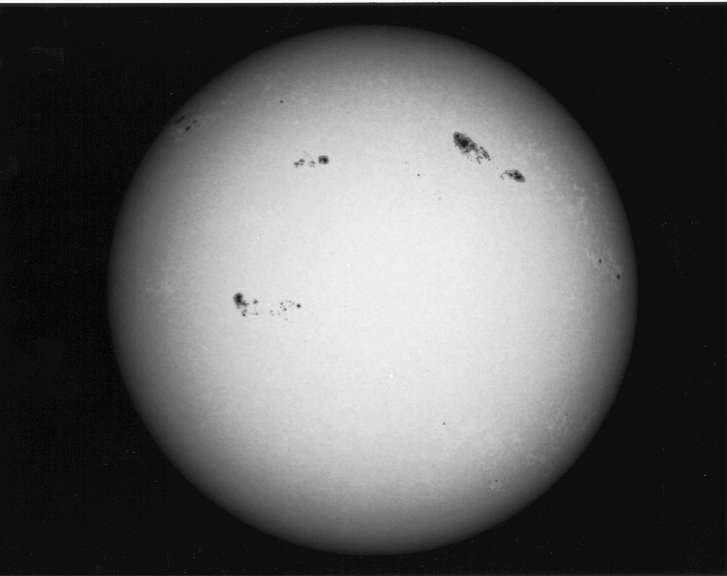 The maximum speed of Helios 2, which achieved its perihelion distance of 0.29 AU on 17 April 1976, is quoted as about 241,350 kilometres per hour. For comparison, the aphelion speed of Helios 2 turns out to be only 72,985 km/h at its farthest distance of 0.983 AU. This massive differential between the vehicle's maximum and minimum speeds graphically illustrates how much an elliptical orbit varies from the circular orbit discussed earlier. The reason the Helios probes were given such unusual orbits is that they were intended to make various measurements of the interplanetary medium between the Sun and Earth. Each probe was equipped with 10 experiments including high-energy particle detectors to measure the solar wind, magnetometer readings of the Sun's magnetic field, measurements of variations in electric and magnetic waves, and a micrometeoroid experiments. The two probes completed their primary missions by the early 1980s but were still sending data as late as 1985. Though they are no longer functional, both craft remain in their eccentric orbits around the Sun. The plasma experiment was the responsibility of the Max-Planck-Institut für Physik und Astrophysik of Munich. It consisted of four independent instruments designed to investigate the solar wind plasma. The bulk velocity, density, and temperatures of the different particles were measured. By measuring the velocity distribution functions of the different kinds of particles, the all-important hydrodynamic parameters of the solar wind plasma can be derived. Three instruments analysed the positive components (protons and heavier ions with energy-per-charge values from 0.155 to 15.32 kV) of the solar wind. Two of them allowed for an angular resolution in both directions of incidence. One instrument measured electrons in the energy range from 0.5 the 1660 eV with one-dimensional angular resolution. The Institut für Geophysik und Meteorologie der Universität Braunschweig in Germany, the Goddard Space Flight Center in Maryland USA, and Istituto di Fisica, Università di Rome were responsible for the magnetometers, which measured the field strength and direction of low frequency magnetic fields in the Suns environment. These fields are extended outwards into space by the solar wind in a spiral direction. The main components are in the ecliptic plane. The Förstersonden flux-gate magnetometer experiments used triaxial, orthogonal flux-gate sensors mounted on a boom extending about 2 metres from the spacecraft. The bandwidth is 4 Hz. Two measuring ranges are used with automatic switching. The sensitivity range extends from -100 nT to +100 nT. In the interplanetary plasma, besides stationary plasma and slowly varying magnetic fields, components of higher frequencies can be found. This experiment complements the measuring range of Experiments 2 and 3 so that the magnetic fields can be measured between 0 and 3 kHz. The object of this experiment is to measure and analyse rapidly fluctuating disturbances and shock waves. Mounted on the end of the 2-metre boom with Experiments 2 and 3, three coils are mounted perpendicular to each other to measure the three components of the magnetic field. The Institut für Nachrichentechnik und Institut für Geophysik und Meteorologie, University of Braunschweig in Germany provided this experiment. NASAs Goddard Space Flight Center, the University of Minnesota and the University of Iowas plasma wave experiment utilized the 32-metre tip-to-tip dipole antenna to detect the electric component of plasma waves. This summary of results from the HELIOS plasma wave experiment demonstrates that this investigation has produced many important new results over the 10 year period since HELIOS 1 was launched. This investigation confirmed a basic theory for the generation of type III radio bursts that was first proposed over 20 years ago, and it revealed the existence of enhanced levels of ion acoustic wave turbulence in the solar wind. The long duration of the observations and the extended radial distance coverage provided a vast quantity of data on the temporal and radial variation of these and other plasma wave phenomena over almost an entire solar cycle. The results obtained show that the plasma processes occurring in the solar wind are very complicated and many important questions still remain to be answered. Hopefully, with the continued operation of HELIOS 1 and further study of the existing data some of these questions can be answered. From the Galaxys billions of stars, the Sun, and from planetary atmospheres charged particles of high energy move at almost the velocity of light into our solar system. Consisting mainly of protons, but also of helium and heavier nuclei, these particles are called cosmic radiation. The cosmic ray particle experiment (University of Kiel in Germany) consisted of a detector telescope containing five semiconductor detectors of increasing thickness, a sapphire Cherenkov detector surrounded by an anticoincidence scintillation detector, and an on-board handling system. The instrument was capable of measuring protons and heavier nuclei from 1.7 to more than 400 MeV/n and MeV electrons. Experiment 7 also measured the X-ray intensity of the Sun. NASAs Goddard Space Flight Center in Maryland and the Institut für Reine und Angewandte Kernphysik of the University of Kiel in Germany handled these two experiments. Experiment 8 investigated the higher energy portion of the crossover region between the solar wind particles and the cosmic rays. The spectrometer utilizes an inhomogenous magnetic field for separation of charged particles. Protons (and heavier particles) traversed the magnetic field almost unaffected and were detected in a telescope arrangement consisting of two semiconductor detectors. Electrons were focussed and detected by four semiconductor detectors. Positrons (if present) were deflected in the opposite direction and detected in another detector. The Max-Planck-Institut für Aeronomie, Kaltenburg-Lindau in Germany provided this experiment. The weak glow in the sky, called the Zodiacal Light, has been known for a long time. It is the result of the scattering of sunlight by interplanetary dust particles. The density and distribution of these particles cannot be measured from Earth so Helios measured the intensity of the light at angles of 15 degrees, 30 degrees, and 90 degrees with respect to the ecliptic. The photometers scanned through a full circle on each rotation of the spacecraft. The intensity of the unfiltered light was measured in three wavelength ranges, 360, 420 and 530 nm. Polarisers could be introduced to determine the polarisation index of the zodiacal light. Responsibility for this experiment lay with the Max-Planck-Institut für Astronomie and the Landessternwarte Heidelberg-Königsstuhl in Germany. Until Helios the characteristics of micrometeoroids had not been investigated to any great extent. Helios investigated the composition, charge, mass, velocity and direction of interplanetary dust particles. Comets have known to be the source of interplanetary dust. The Max-Planck-Institut für Kernphysik in Heidelberg, Germany provided this experiment. Perspective view of the solar system, not to any scale, and the Earths magnetosphere and the Suns features are greatly simplified and magnified to show them clearly. 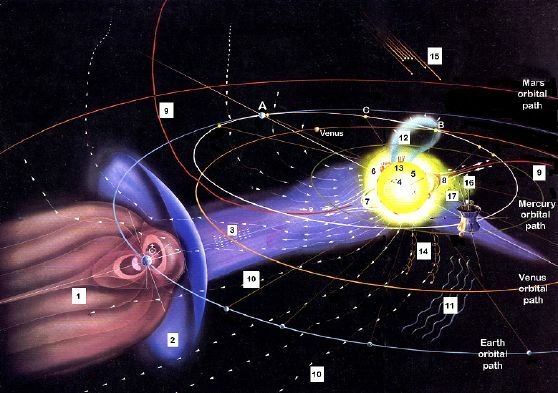 Helios 1 was launched from Earth at the position marked A and its orbital path is shown in white. The Earth and Venus are shown when Helios reached its closest approach to the Sun the first time. Mercury at the same time is shown just below Helios. There was a blackout period when Helios passed behind the Sun, shown between points B and C. 1. The Earths magnetosphere is shown streaming away from the Sun. 2. The Earths shock front. These two features are formed by the interaction between the Earths magnetic field and the solar wind passing by. 3. The Solar Wind originates from the hot Corona and travels at speeds of up to 1,800,000 kilometres per hour. It is not uniform as it is affected by magnetic clouds, interacting regions, and composition variations. If a slow moving stream of solar wind is overtaken by a faster moving stream the resulting interaction produces shock waves that can accelerate particles to extremely high speeds. It streams out like the water from a lawn sprinkler as the Sun spins on its axis every 27 Earth days. 4. Sunspots on the surface of the Sun. Sunspots have been known to exist since the invention of the telescope - Galileo is often quoted as one of the first to refer to them around 1610. Sunspots are thought to be the result of pent-up magnetic fields below the surface of the Sun breaking through making relatively cool areas when new hot gas is inhibited from reaching the surface. Sometimes larger than the Earth, they can be in groups, and last for weeks to months, depending upon their size. They do not appear randomly over the surface - they are concentrated above and below the solar equator. Spots that appear in the northern hemisphere are mirrored in the southern hemisphere, mostly in pairs, the leading spot carrying the opposite polarity to the trailing spot. Sunspots are linked to the Suns magnetic activity, their number rising and falling over 11 year cycles, called the Solar Cycle. 5. Long Filaments stretching out from the surface of the Sun. 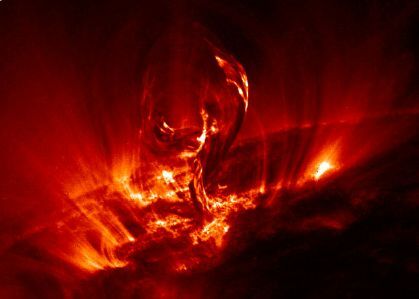 Filaments are long, thin regions of relatively cool gases stretching 100,000 kilometres out from the surface, held in place by magnetic fields above the chromosphere. They can last weeks, or months before dropping back to be absorbed back into the Suns surface. A Filament photographed by the satellite TRACE. 6. 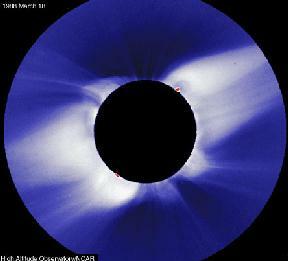 The hot Corona is grouped into three types, the White Light Corona, Emission Line Corona, and X-Ray Corona. 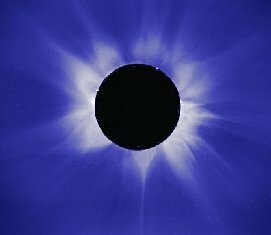 The Corona is the upper atmosphere of the Sun and can only be seen during total eclipses or with the use of special equipment as it is a million times darker than the Photosphere. The left image during a solar eclipse in 1980, near solar maximum activity, shows streamers all around the disc, while the right image taken in 1988, near minimum activity shows large bottle shaped streamers concentrated at the equator. 7. Coronal arches are fountains of hot gases stretching 480,000 kilometres above the surface. They heat up as they rise through the first 16,000 kilometres, flow along the magnetic lines and cool down as they stream back into the surface at more than 360,000 kilometres per hour. Millions of different sized arches make up the corona. 8. Streamers of magnetic loops extending between areas of opposite magnetic polarity. Streamers and loops are hot gases trapped in magnetic field lines up to 800,000 kilometres long. They emanate from constantly changing north and south poles scattered all over the surface. The magnetic fields are believed to originate from a region 220,000 kilometres below the surface which scientists believe is the source of all magnetism in the Sun. 9. The Coronal arches can continue into boundary regions in the interplanetary magnetic field. 10. The Interplanetary Magnetic Field, also called the IMF. Originating from the Sun the IMF spirals out (called the Parker Spiral) carried by the solar wind through the heliosphere to eventually reach Interstellar Space beyond the planet Pluto. 11. Alfven waves and shock waves (12) produced during flares on the Sun can cause kinks in the Suns magnetic field. Like the movement of a plucked guitar string, they travel down the Suns magnetic field, embedding in the solar wind to eventually cause auroras on Earth. They are named after Hannes Alfven who discovered them in 1942. 13. During flare eruptions, radio waves and X-ray waves occur when charged particles are accelerated to high energies. 14. The propagation of solar radiation takes place in the Coronas magnetic fields and in the spiral paths around the interplanetary magnetic field. Solar radiation is the electromagnetic radiation (light energy) transmitted into space in units of photons. Without this radiation life on Earth would not exist. It is over 9 KW/metre squared at Mercury, dropping to about 1.6 KW/metre squared at Earth to almost 0 at Saturn. Roughly half the radiation that reaches the Earths upper atmosphere reaches the surface. 15. Galactic cosmic radiation constantly penetrates into the interplanetary medium from outside the solar system. 16. The scattering of sunlight on small dust particles in space produces the Zodiacal Light. These dust particles are released into the interplanetary medium by comets and small asteroids. The smaller particles are blown away by the solar wind but the larger particles, 0.1 to 100 micrometre, spiral in to the Sun and form a flattened disc around it in the ecliptic plane, visible from the Earth under certain conditions. 17. Zodiacal Light may be regarded as a continuation of part of the Suns low-intensity Corona.